SkinnyPop starts with a premium popcorn kernel, sunflower oil and the perfect amount of salt. From there, Pure Popped Perfection™ says it all. 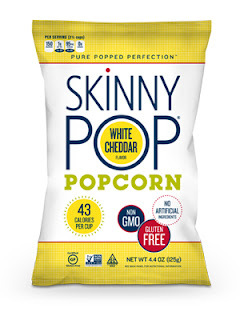 Our popcorn has no GMOs, gluten or preservatives, making SkinnyPop a tasty, guilt-free snack. Guilt-free snacking with just the right amount of salt. Ingredients: Popcorn, sunflower oil and salt. are completely nut, egg, and dairy free. Guilt-free snacking with a dairy-free white cheddar flavor. Ingredients: Popcorn, sunflower oil, natural non-dairy cheddar flavor, salt, rice flour, natural flavor and lactic acid. Skinny Pop Popcorn is the perfect light snack! I'm a huge nighttime snacker so I'm always on the lookout for healthy snacks. 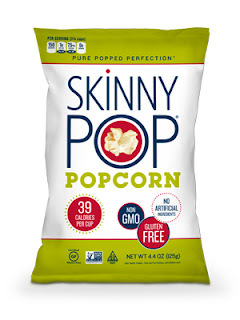 I love that Skinny Pop Popcorn has no artificial ingredients and is non-GMO. When I snack at night I crave either something sweet or something salty and let me just tell you these are a wonderful way to satisfy that salt craving. The original flavor is lightly salted and tastes fresh and wonderful. I have always loved cheese flavored popcorn so the white cheddar popcorn is my favorite. The white cheddar flavor is lightly seasoned but has enough flavor to satisfy my taste buds. I absolutely love this popcorn and highly recommend it! Click HERE to locate a retailer that sales Skinny Pop near you! Follow Skinny Pop on social media!